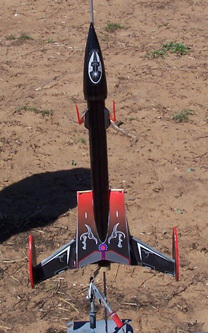 This rocket is a 18mm futuristic space fighter using parachute recovery system. When I became a BAR, I found numerous kits that I absolutely HAD to have. Many of them came from Fliskits. The problem was I was well aware of my technical skills and was loathe to butcher such nice projects. As a result, I spent a lot of time working on simple "level 1 and 2" rockets while staring wistfully at the cool designs in the 3, 4 and 5 bins. I finally decided to give one of the nicer looking ones a try and picked the Fliskits Stingray to embrace. I figured that most of those kits look so good, some of the reflected glory might rub off on me. Other reviews have listed the parts so I will not. Rest assured, they were all present and of good quality. 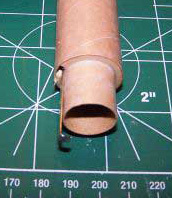 Construction begins by marking the motor tube and cutting a slit for the retainer clip. The clip is held in place with masking tape and a thrust ring is inserted. There are two centering rings and each needs to be modified. The first one has an 1/8" sector removed to accommodate the retainer clip and the second has a small notch cut in it to allow the Kevlar® shock cord to pass. Both rings are held in place with white glue. 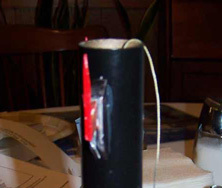 The shock cord is attached to the motor mount by tying a slip knot around the motor tube and then passing the thread through the notch cut above. The motor mount is then slid into place and glued into the body tube. It should be noted that this kit is designed so that the motor mount hangs out a good ways past the end of the BT. Now that the BT and motor mount were ready, I needed to transfer the marks for the fins, gun mounts, etc. to the BT. This was done by means of a wrap around guide and was easily achieved. The lines were marked, identified and extend the length of the BT. Apparently, some of the wrap kits provided as accessories for this kit include a wrap for the body tube. Mine did not. If it had been included, it would be at this point that the instructions would have sent me off to apply the wrap to the BT. Afterwards, the builder is instructed to return to the same place in the instructions and continue from there. In my case, I just got started on the next step. The next step was to actually cut balsa. Except for an old Estes Mosquito, this is the first time I have had to do this since my return as a BAR. It is probably what made me the most nervous but it turned out to not be too bad. The kit comes with paper templates that are cut out and then used to trace a line around the pristine sheet material provided. This was easily achieved but I cannot emphasize the importance of using both a sharp pencil for the marking and a sharp knife for the cutting. I decided to cut out all my pieces at once. When the pieces were cut, I went on the the next step where I was instructed to sand an 1/8" bevel into the leading edges of the two fins. To do this, I marked of the 1/8 inch and then placed a line of cellophane tape across the length of the fin. I did the same with the reverse side. The tape was then used to give me a guide as I was sanding and prevent me from sanding too far. The after bulkhead was also assembled at this stage. The template provides for two pieces which are almost mirror images of each other. Each of these pieces needs to be marked on both sides in terms of left and right and upper and lower. When the pieces are cut out, a slight bevel is sanded into the forward facing edges in order to accommodate the body wrap shroud. Then each of the two bulkheads is cut in half to make a total of four pieces. 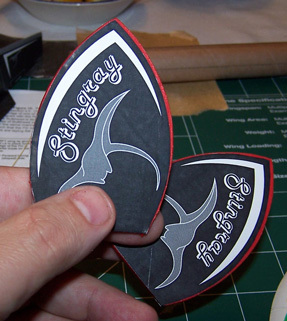 These pieces are then glued, 2 per fin, to the root edges of the fins. Alignment is critical so the template provides a mark for 1/8" in along the trailing edge. This mark must be transferred to the bulkhead and then used to match the edge of the fins. At this point, there is another directive to see special instructions if you are using one of the wrap kits. I dutifully turned to the appropriate instruction and learned that it was time to seal and paint the fins before applying the wraps. I did so with Elmer's Fill 'N Seal® and then sprayed the fins black. I need only have bothered with the trailing edge but I went ahead and painted most of the fins. When the paint was dry, the wraps for the fins were carefully cut out with a razor knife. The wraps include a scoring line that aligns along the bevel on the leading edges which I scored with the razor knife. Unfortunately, I pressed a little too hard with the first pass and cut too deeply. That did making loading it in half a snap, though. 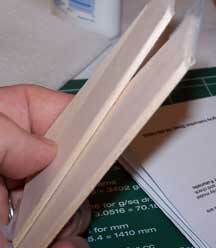 The outer edge of the fin is then aligned with the end of the wrap and the whole fin is carefully set into the crease. The instructions recommend and I heartily support practicing this a few time before peeling the backing off of the wrap. When you think you have it down, peel the backing and press the wrap onto the fin. The procedure is then repeated on the opposite side. The wingtips likewise are supposed to be filled and finished before apply the wraps. Here is where my brain broke down. Being lazy, early in the morning, I hit on the bright idea of using white glue to fill the edges. It was already out and the Fill 'N Finish was all the way out in the garage. Bad idea. I suppose it could work eventually but takes too long to dry, the balsa seems to drink the stuff and sanding is a nightmare. In any event, instead of painting the edges black, I opted for painting them red for contrast. Strangely enough, I found that applying the stickers for the wing tips was more difficult than applying the wraps to the wings. This was because of the shape. The stickers were easy enough to cut out; I opted for using scissors for this step. I then peel a little bit off the back and tried to get the balsa centered. That was more easily said than done. The balsa I had cut was not perfect and it shows especially since the red of the balsa contrasts with the black of the stickers. The instructions noted that I might have to trim the sticker but I would up with a surplus of balsa and no trimming was needed. When both wingtips were done, I sealed the edges with white glue as per the instructions. The next step returned me to the main thread of the instructions to mount the wings to the BT. In the interest of strength, I used a safety pin to perforate the root edges of the wings and the BT along the installation line to form glue "rivets." Then it was a matter of test fitting each wing against the BT. It is critically important at this step to ensure that the root edge of the wing lies flush against the BT. I had to do some sanding on the aft bulkhead to make this happen. When all seemed to fit right, I glued on the left wing. After waiting a decent amount of time for the glue to set, I glued on the right wing. Since this wrap kit did not include a body wrap, the instructions indicate it is time to paint. Much of the rearward part of the body will be hidden by the final paper shroud so it is the front of the rocket that is important here. I wrapped the tale in aluminum foil held down with masking tape and painted the rest of the BT black. After a few coats of black paint, I let the BT dry and got to work on my sermon. As a reward for finishing the sermon without too much rambling, I decided to spend some late time working on the Stingray. I was pleased with the paint and set about working on the main body shroud. The main body wrap is the final part of the special instructions for the Maelstrom body wrap. The basic Stingray comes with a 2 piece white shroud. The Maelstrom comes with a one piece, nicely decorated shroud. Cutting out around the outer edges was not too onerous. I made sure I had a fresh blade and a steel ruler and started to cut. After it was removed from the rest of the card stock, I used the razor knife to lightly score the lines where it will need to be folded. Then came the hard part. I had to cut out the central oval. I took this slowly but was not particularly pleased with my work. I did, on average, manage to cut out too little rather than too much but the curves did not flow well for me. I never did like cutting curves. I managed to solve part of the problem with 220# sandpaper. I sanded around the inner edge until I was more (as opposed to completely) satisfied with the result. When the shroud was cut out and scored, I prefolded it and test fitted the two halves together. I found a few more places where I needed to even things up but a little sanding and a little razoring took care of that. Then it was just a matter of gluing the halves together using the tabs. It didn't look too bad. Then tragedy struck. I test fitted the shroud around the BT. At that point I learned that I had grossly misjudged what would and what would not be exposed. With that, I remasked and set out to repaint the BT. When the repainted BT was ready, I tried slipping the shroud around the body to check the fit. I found a few tight places, which were treated with a razor or sandpaper, and that I had not given the after bulkhead enough of a chamfer. That was quickly treated with some sandpaper as well. When I was happy with the fit, it was time for the most tedious and, for me, difficult portion of the project. It was not all that hard except that I hate waiting. NOTE TO MR. FLIS: I would gladly pay much extra for some sort of jig to do this for me; the kids were not willing. It was worth it, though. When I could safely let go of the body and shroud, I got to work on the gun mounts. I had previously cut these out and assembly was fairly easy. The upright portion is sandwiched between two plates. It is held together with white glue and a piece of sawn toothpick is glued to the upright to be the gun. When it was together, I found that my precision in cutting was better than I expected but not good enough. I used a sanding block to even things out and then wrapped some sandpaper around the BT in order to sand a curve into the mounts. I then applied some sealer and set it aside to dry. Unfortunately, the only photos that came out are without the toothpicks. The wingtips are fairly easy to attach to the wings. The body wraps provide a cutout place where the edge of the fin is to intersect the wingtips. 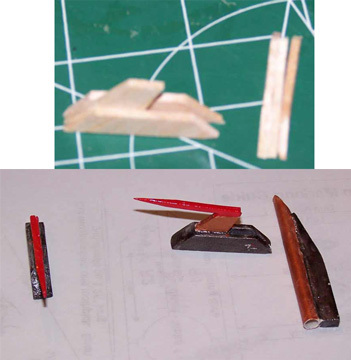 I again used a safety pin to perforate both balsa surfaces and form glue rivets. I then glued the tips on and checked for straightness and alignment. Having them in place made a huge difference in the appearance of the rocket. The launch lug mount was also simple. 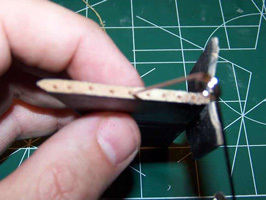 The lug is glued to an angled piece of balsa. When it has set, a razor is used to cut the lug at the same angle as the mount. Since I had a bit more time before bed, I decided to seal the nosecone. I glued in the eye screw, painted with Elmer's Fill 'n Finish, and hung it up to dry. Now was the time for detail work. I sealed the gun mounts and launch lug, sanded them down and primed with white spray. I figured that finishing them after they were mounted would be a nightmare so I decided to finish them now. I also decided to hand paint them. The bases for both were painted a Tamiya color called bronze. When I opened it up, it was a bit grayer than I had imagined but still serviceable. 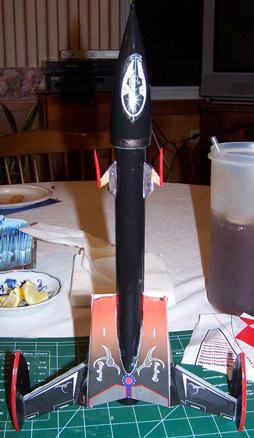 The launch lug itself as well as the center supports for the canon were painted with Tamiya copper. Copper is my favorite metallic shade and I tend to use it whenever I have an excuse. The guns themselves were painted red. While those were drying, I sanded down the nosecone and used an emory board to sharpen up the diameter stepdown. I then primed it with white spray. Figuring that between spraying the nosecone and taking time out to help the stepson with some chemistry homework, it was safe to handle the little pieces again. I realized that I had made another blunder. Back when the BT had originally been marked, marks were laid down for the gun mounts and launch lug. The black paint had completely obliterated them. Wanting to do a better job on the alignment than could be had from my eyes alone, I printed a sheet with the alignment wrap. (I always make PDFs of instructions, balsa, templates and such before starting a build. )I then wrapped the alignment sheet around the BT and held it closed with some tape. Using that and aligning with the wings by my eyes I felt I could come close to the "right" place. I used a razor knife to nick the paint 1/2" back from the front of the BT along the gun mount lines. I then transferred the length of the mounts to the BT with another light nick. A file was then used to remove the paint along the ling of the gun mounts. A safety pin was used to make perforations in both the the root edges of the mounts and in the BT to form glue rivets and the mounts were glued in place. The launch lug was similarly attached but I did one more thing to make sure it was straight. I took a short section of 1/8" rod and used that to help align the lug. After the nosecone had been sprayed black, I decided I wanted to add a little bit of contrast. I decided to paint the part of the nose cone that is stepped down, but not the part that fits in the BT, the same colored bronze that I used on the gun mounts. I masked accordingly and painted it by hand. Then it was a simple matter to cut out the sticker for the cockpit and put it in place. It was a bit less simple to keep it straight and unwrinkled. Likewise, finishing the after bulkhead was accomplished by cutting out the sticker and placing it. I recommend that when cutting the hole for the motor mount, leave a slight bit of excess material. Then use a piece of sandpaper wrapped around your finger to ream it out flush with the correct profile. I found the the sticker with the backing paper is sturdy enough to handle this and is sure easier than trying to cut a circle. That brought the building to a close. CONS: most human beings have too few hands to adequately handle the installation of the body shroud. Most of the finishing took place during the build phase and is detailed above. I did give the rocket a coating of Future® Floor Polish to toughen it up a bit. I don't want to mar this up on landing. I started out wimpy on an A8-3. The chute was loaded after a bit of dog barf, the nose cone was seated and the motor installed. While I was hooking up the leads, I enjoyed the favorable comments from others about the appearance of the rocket. When it was time to lift off, I pushed the button and it took right off, flying straight up. There was no barrel rolling at all. It did not fly particularly high but it was high enough to make me feel "safe". Ejection occurred right on schedule and the chute deployed just fine. It landed without any problem. For the second flight, I chose a B6-4. Again, everything went like clockwork. The rocket went up and the rocket came down. In between, at about the right time, the chute came out and slowed the decent. That was good. Unfortunately, RSO duties prevented another flight.